If all goes well I should get my overhauled engine back in bits in June. Last year I removed all turbo parts and sold most of them. The block will stay the same, but there is a new stage 2 high head and high compression pistons. Also a new camshaft SW5 from Swifttune. I will only use one TB that will be installed on a standard MG Metro inlet manifold. I got this set with everything on: TPS, MAP, fuel pressure regulator, 2 330cc injectors per TB, it even has a choke (although I will be removing that). It's an Emerald K6 ECU that can hold 3 maps. I got a 3way switch with it, so in theory I could have f.e. an Eco map, road map and track map and switch between them while driving. It came from a Clio, so the loom I got with it is also from a Clio. I will canabalize it to make a loom for the Midas. The next step is to buy a broadband lambda system with cockpit dial. Then I can run the ECU closed loop, I insert a required AFR in the map and the ECU regulates the injectors to get to this AFR. I am quite excited by this, but no doubt it will be a steep learning curve and a lot of cursing to get from books and theory to something working. Also a zillion other small parts need to be bought, wiring, special plugs, the trigger wheel and sensor bracket, relays, fuses etc. I except to be busy setting it up during July and be on the road in August at the earliest. TBC. I was wondering if you would be using the twin throttles and secondary fuel injectors on this kit to make up the difference with the pulses but now I see your going for the one throttle body. Keep up the good work and I am sure others will also be watching with avid interest. Yes one Tb is enough for 90 bhp else the air flow would be too slow. 330cc per injector should be enough for a wet manifold setup. It just mimicks a carb. The only thing is that usually the TB is 90degr. rotated to have one injector on top and one at the bottom. This will prevent a possible problem I may have, that the injectors spray directly in one port of the inlet manifold resulting in an unstable run. But I will be using an adaptor of a few cm long that hopefully will prevent this. 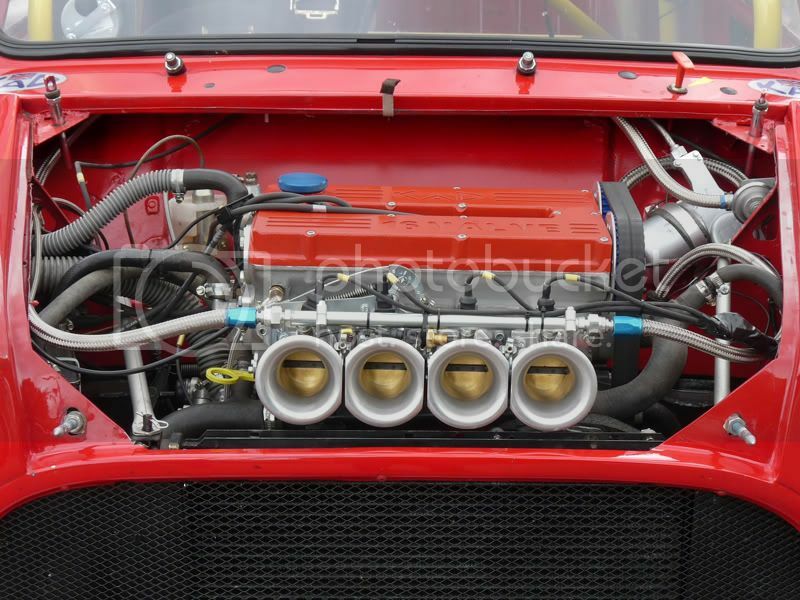 I don't like the idea of a injector too close to the exhaust. SC did a clever TB design with 2 injectors on top (there is a good video of it) but these Honda tb's are so cheap I could not resist. The new head is not yet ready, so it will take another 2 weeks or so. This engine is a 1293cc with a sw5 camshaft, lightened flywheel and high compression head and pistons. With the injection and ignition I hope to get to a reliable 90bhp. I sold the MED low compression head and dished pistons to someone who is going to put a compressor on his block. That engine was still in the shop as well and looked fantastic (sorry forget to take pictures of it). My engine builders race their engines up to 8500rpm, even with points ignition (classic series). They built a special testbench for the ignition because they could not get past 7500rpm with the original distributor! This due to vibration in the distributor shaft. He said they lost about 10bhp due to the distributor shaft, so I am glad mine is gone. Looks like your on track for next year then. Looking forward to you posts on the EFI installation/ testing. Yes that's going as well. The edge of the crankshaft damper is milled off, so the timing wheel can fit on that. Once they have the good position, they'll drill and tap a few holes to fasten it with screws and locktite.